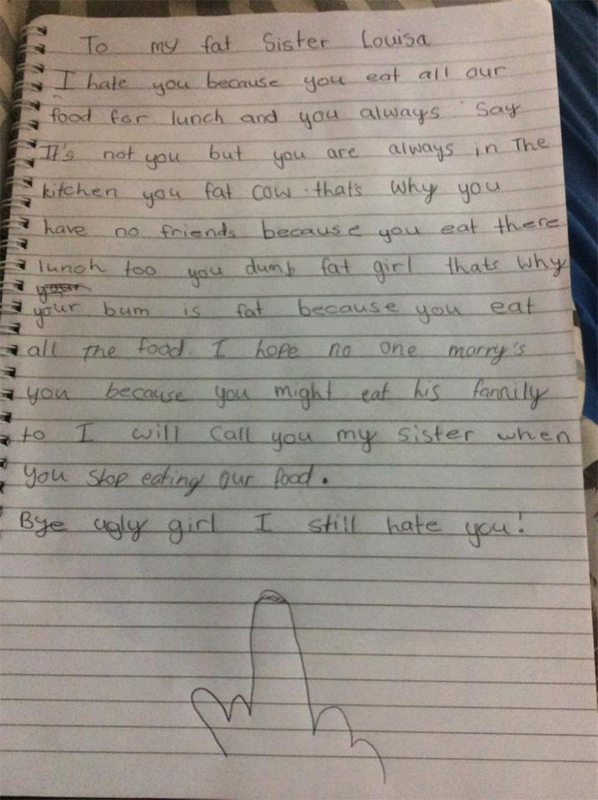 A girl has written a letter to her "fat sister Louisa" after Louisa allegedly "ate all our food for lunch". The girl alleges that this wasn't the first time her sister had stolen the food, and claimed she "always" said said it wasn't her but that Louisa was "always in the kitchen you fat cow". "I swear she's a lil brat 👊 I don't even eat that much so idk what she's talking about 😂😏 Fully draws the finger too 😂 "
The "finger" she is referring to is the massive middle finger the younger sister drew at the bottom of the letter, in case her sister had missed the aggressive tone of the rest of the letter. "Your bum is fat because you ate all the food"
The girl alleges her sister's "bum is fat because [she] eats all the food". The letter then goes on to suggest that she hopes Louisa never marries, out of concerns for the safety the husband's family. "I hope no one marry's [sic] you because you might eat his family to [sic]." She then goes on to tell Louisa that she will only start calling her her sister when she ceases to eat all the family's food. Louisa has so far neither confirmed nor denied whether she ate all the family's food, though commenters have said she does not look like the "fat cow" her sister paints her as in her letter, and suggest the allegations against her may be proved false if they were to reach court. The girl finished the letter with an unusual sign-off. Forgoing the standard "yours sincerely" or the more formal "yours faithfully" which would convey an icy disposition towards Louisa, the young girl opted for the massive drawing of a middle finger as a sign-off. Those who don't have time to draw their own middle finger at the end of their letters / emails, write "regards" instead. This is the email sign-off equivalent of "f*ck you" and the recipient will get the gist. The post has been liked over 9,000 times on Facebook, and Louisa doesn't seem to be too angry with the letter from her younger sister, though she says the allegations against her are false and alleges her sister is "a little brat" but admires her finger work. The little is expected to one day fit right in in university halls, having already mastered the art of the passive aggressive note.